Clean, clear navigation is vital to successful website design. You can have the best content, advertising, and page design in your industry, but it’s of little use if your site visitors don’t know how to find it. With well-planned navigation, your customers will be able to move through your site seamlessly, without stumbling over discouraging distractions. Easy navigation also increases engagement, and makes visitors more likely to dig deeply into your content. Great navigation starts with careful planning. Throughout your site, navigation options need to be clear, logical, and consistent from page to page. Don’t be afraid to follow common navigation conventions, either. It’s much easier to build effective navigation when you use a framework that’s familiar to site visitors. Ahead, you’ll learn more about the three most common ways to organize navigation, so you can choose the option that works best for your Calgary business. Task-based and topic-based navigation are most commonly used, so we’ll cover those first. As you might have guessed, topic-based navigation is typically the preferred choice for sites that primarily provide information, while task-based navigation is ideal for sites that allow visitors to complete specific tasks. Consider the primary purpose of your website before deciding on navigation. Task-based navigation should be organized in a logical way that guides site visitors through the completion of the task. Banking and insurance websites are often task-based, to help visitors more easily navigate complex concepts. If you choose tasked-based navigation, your links should each refer to a specific task. A banking website, for example, might include links for opening a new account, logging in to your existing account, and managing online bill-pay, to name a few. Regardless of your navigation setup, always try to use clear, widely used terms to label your links. Using jargon only serves to confuse visitors, and slows them from completing their task. 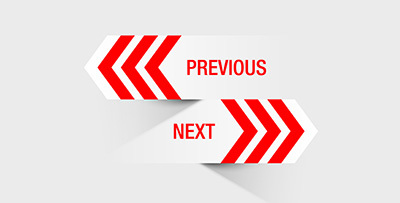 Topic-based navigation follows the same basic concepts, with a few slight twists. You’ll still want to use clear terms, and follow a logical progression from one page to another. The difference is that you’ll be guiding visitors through the learning process, not the process of completing a specific task. Large retail websites are often topic-based, to allow customers to more easily sort through a vast array of products. Pages might be broken up by target demographic, or by product type. If your website exists primarily to inform customers about your business, topic-based navigation will likely be your optimal choice. Your main categories will cover each key aspect of your business, with subcategories that go deeper for visitors who want to learn more about a given topic. If you’re marketing to a very specific demographic, you might consider navigation based on personas or identities. First, you’ll create buyer personas based on your ideal customer (such as student, member or even patient), or dust off the personas you already have. Then, you build a website that specifically targets those personas. Persona-based website design is an interesting choice for businesses with a strong identity. It’s not the best way to appeal to a broad audience, but it can be very effective in targeting specific demographics. If you choose persona-based design, don’t just go for one persona. Create content and landing pages for each of the personas you target. No matter how you choose to organize your navigation, it’s important to make sure your website works as well on mobile devices as it does on larger screens. Responsiveness and accessibility are vital to all aspects of your website design, not just navigation. With responsive, logical, thoughtful navigation, you can dramatically improve the user experience of your website, generate more leads, and ultimately earn more customers for your business. Finding success online starts with great web design. The expert website design team at Emphasize Design is here to help with all of your online marketing needs, from site navigation to marketing that generates more leads, for less cost. We look forward to hearing from you!